These two talented students from the Art Institute of Austin are both Art Bra Artist newcomers, but they are exploding onto the scene with a surplus of creative generosity. 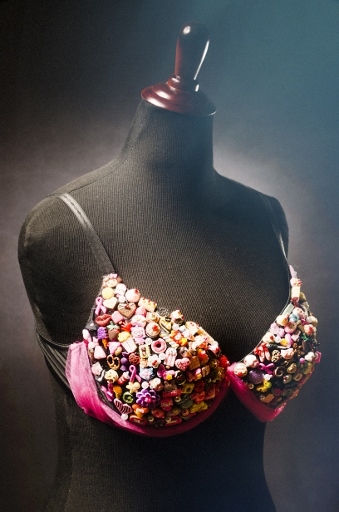 Although neither Anakaren Padron nor Amanda Perez have a connection to the Breast Cancer Resource Centers — or are connected with any one of the models — they both felt strongly that their creative gifts could be used to benefit those diagnosed with breast cancer. As Amanda explains, “No connection. Just here to help! Girl-power, baby!” Art Bra Austin is fortunate to benefit from their passion and youthful spirit. Anakaren’s grandmother is a breast cancer survivor, and other members of her family have had additional types of cancer, so she feels fortunate to be in a position to use her gifts to help. A Fashion Merchandise/Marketing student at the Art Institute of Austin, Amanda says, “I just want to make everything around me beautiful.” And having moved to Austin just over a year ago, she promised herself that she would push herself outside her comfort zone and say “yes” more often. 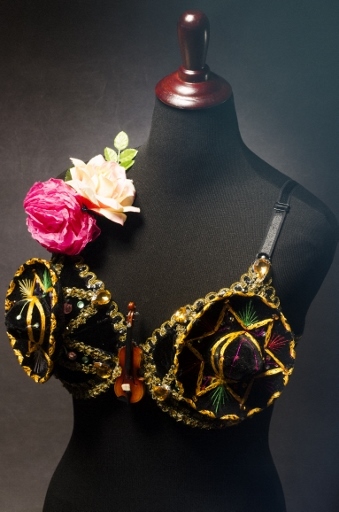 Amanda recalls her aunt Tia Dora making mariachi Santas for Christmas when she was a child, so she was inspired to create a tasteful bra around that theme. Using mini velvet sombreros, black velvet, rhinestones, a toy violin, fabric trimmings, tissue paper and artificial roses, she combined all of the elements and attached them with glue until she was satisfied with the creation. It’s easy to see how Amanda describes her style as eclectic hippie with a side of sass!